A lot of things may be going on for rock star/actor/music heartthrob Rico Blanco, Cosmopolitan's Man On Fire for January 2011. 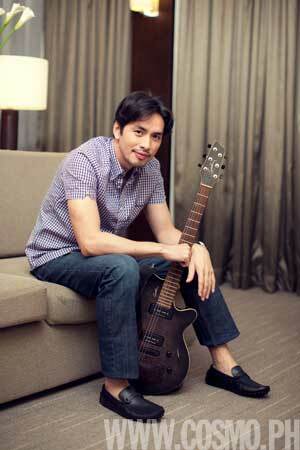 Since his debut in the Pinoy rock scene in 1993 as part of the iconic OPM band Rivermaya, Rico has made a name for himself as a singer, legendary songwriter, and unrivaled musician. He has since gone solo, but that didn't stop his music star status from rising even higher. He has also done a lot of other things, including creating his own line of shirts for local clothing brand Human. This probably paved the way for the launch of his own clothing brand, KOBOI. Recently, he decided he wanted to break into mainstream showbiz as an actor, and he's now playing Lucas in the primetime fantasy soap on ABS-CBN, Imortal. It seems whatever Rico touches turns into talent gold--from music to acting and fashion. Is there anything this guy can't do? Apparently not, because even when we asked him to pose for several layouts for this Cosmo shoot, he was a complete natural in front of the camera. He was just so hot, the entire Cosmo team was on fangirl mode that night. In the nice, comfy suite at Sofitel Philippine Plaza, photographer Roy Macam's photos of Rico gave us a glimpse into the OPM star's relaxed, fun side--as opposed to the brooding, emotion-filled musician we often see when he's performing. To suit the shoot's comfy, laidback concept, Cosmo associate fashion editor Happy Lopez picked out casual clothes in cool hues (which Rico loved!). 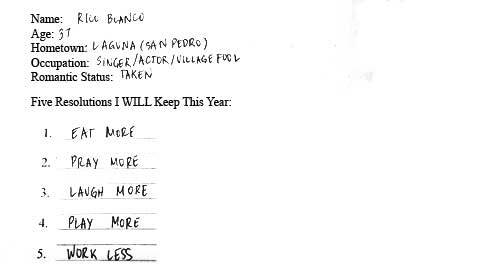 And, since it's start of a new year, we just had to ask Rico about his resolutions for 2011; he said he doesn't really make those. "When I want to do something, I don't wait until the New Year. I just go ahead and do it," he said. Still, with a little prodding, we got him to write down a handful of resolutions or things he wants to do in 2011 anyway. Click on the button below to view a gallery of exclusive behind-the-scenes photos of Rico's Man On Fire shoot. Watch for his highly entertaining and totally kilig-worthy video on CosmoTV! Read Rico Blanco's full interview when you grab the January 2011 issue of Cosmopolitan Magazine, with Anne Curtis on the cover, in stands now!